Authors note: Since the original publication of this column, Amazon announced its intentions to buy Whole Foods and place themselves squarely in the bricks and mortar food retail market. While many initial reactions have focused on Amazon’s ability to provide home delivery of groceries (which is actually kind of retro), we believe the real advantage Amazon brings will be their ability to acquire and leverage data about their customers, which they will use to dramatically alter the grocery shopping experience. 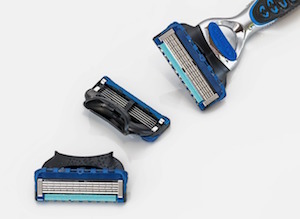 The battle of the razor brands has been getting pretty feisty in the last few years. Newcomer Dollar Shave Club created an effective contra-brand that took share from Gillette and Schick by building an online mail order business model that thumbed its nose at the big brands’ $5 cartridges. The concept nicked enough business to prompt Unilever to pay $1 billion for the company before it was even five years old. Gillette responded by starting its own mail order option. Now Schick is getting into the online, direct order business, as well. Better late than never, I suppose, but Schick’s shtick this time is that, while it sells its own blades, of course, it is also selling blades that fit Gillette razor handles. Presumably their patent attorneys checked this out in advance, but can Schick really pull itself up by picking off a few customers from the market’s leading brand? I doubt this me-too approach will make much difference to Schick’s bottom line, but it likely has given Gillette something to think about. Amazon, however, having established itself as the leading online retailer in the universe, is taking a far more strategic pass at the very category it disrupted at the start—retail bookselling. The A-to-Z (the arrow in their logo points from A to Z, if you haven’t noticed) online giant has now opened several bricks and mortar bookstores, including one recently at Columbus Circle, New York City, in a space where Borders once operated. Ouch. But what Amazon really appears to be doing is experimenting with combining online sales techniques with in-person, on-the-shelf retail. The shopping experience mimics the online one in several ways. There is no pricing on the books themselves, since the shopper’s status as a Prime member affects the price of the item. (Customers use a small, hand-held scanner to see the pricing options.) All books are displayed cover out, just as on the website, and as opposed to the narrow spines prevalent at many traditional stores. As with the web experience, there are frequent “you might also like” signs next to popular items. Amazon is also using its mountains of bookselling data it has accumulated through its web-based sales to select its physical offerings in the stores. This is where their move to grow their brand’s influence far outshines what Schick is doing to sell a few more razor blades. While Schick is making a small modification to their product to ding its competitor, Amazon’s deep wells of data, gained from their online dominance, give them an advantage at retail that is somewhere between difficult and impossible to imitate. A good guess might be that Amazon isn’t looking to grow rapidly in book sales as much as it is trying to hone its retail skills overall. Amazon has also stated an interest in moving into convenience store markets and groceries, again utilizing their technical devices and vast databases. If I worked in either category, I would be keeping my eye on what Amazon is up to. Schick has made a move that will be a nuisance to Gillette and likely not affect Dollar Shave Club much at all. But Amazon, having already redefined the bookselling industry, is now building the skills to position their brand to take on other traditional retailers, using technology, data, and a healthy dose of audacity. Look out 7-Eleven and Kroger, here comes Amazon. Taylor Brand Group is a brand consulting firm located in Pennsylvania (PA) that provides branding services to clients in Lancaster, Harrisburg, York and Reading, as well as Washington, D.C., Maryland and Virginia. We provide a full range of services in brand development and market research, assisting our clients with brand strategy, rebranding, new product/service launches, and, much like an ad agency, providing ongoing promotion and marketing of their brands through advertising, digital marketing and social media. Welcome to Brand Central Station! Want more insights, appreciations and rants about branding? Sign up for our email list, and we’ll keep our brand ideas and insights flowing, while promising not to share your information with anyone. Seriously, what’s a couple more emails a month? Does your brand have to have a slogan? Yes, no, and maybe. All content is © 2019 Taylor Brand Group. All rights reserved.